Other browsers may work but are not fully tested or supported. The information provided will not be shared, sold or used in any way other than to contact users to announce new features. Isotopes are forms of an element whose nuclei have the same atomic number, the number of protons in the nucleus,but different atomic masses because they contain different numbers of neutrons. Cell: model the transmission/radiance of a gas cell. Specify it's length, temperature and pressure, and the vmrs of the absorbing gases. LINEPAK: The GATS spectral radiance and transmission software library. Performs detailed and accurate line-by-line modeling of molecular absorption. Efficient and flexible, LINEPAK is at the heart of analysis systems for many major atmospheric remote sensing missions, including HALOE, SABER, LIMS, SOFIE, CRISTA, and CLAES. Tangent Path: Model the transmission or radiance of a ray that passes completely through the Earth's atmosphere but does not intersect the Earth. 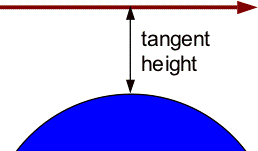 The path is specified by the tangent height, the height at the point of closest approach to the surface. The pressure, temperature and vmrs of absorbing gases at each altitude are chosen from a database of atmospheric states. Slant path: Model the transmission or radiance of a ray between two arbitrary points in the Earth's atmosphere. The points are specified by their heights and the zenith angle from one to the other. VMR: volume mixing ratio. The fractional number of molecules of a species in a volume. Individual vmrs and their sum must be between 0 and 1. Clicking this will display the data as text in a new browser window. Right-clicking will download the data file to your computer (recommended). These files can be extremely large depending on the spectrum simulated. Clicking this will open a new browser window suitable for printing. You have exceeded your daily limit. full tech support and much more. Subscribe now for full access to the Spectral Calculator tools. Get priority use of advanced, state-of-the-art radiative transfer algorithms--the same ones used by NASA for many remote sensing missions. Subscribers gain access to large wavebands, multiple gases and cells, choice of units, radiance spectra, logo-free high-resolution graphics, data files, full tech support, and much more. Temperature Offset: The model atmosphere (US_Standard, Tropical, etc.) determines the temperature, pressure and gas concentrations at each height in the atmosphere. To adjust the temperature from the model value, enter a temperature offset (from -50 to 50 K). The Atmosphere Browser tool displays the temperature profiles for the model atmospheres. Atmosphere: An atmosphere contains profiles of temperature and gas concentrations at all altitudes. There are six system-supplied atmospheres for Earth and one for Mars. Custom atmospheres can be uploaded from the Atmosphere Browser. Scale Factor for Gas Concentrations: The model atmosphere (US_Standard, Tropical, etc.) determines the gas concentrations at each altitude. To adjust a gas concentration, choose a scale factor, from 0 to 1000. For example, to simulate an atmosphere with 20% more water vapor than the model, enter a scale factor of 1.2 for H2O. Note: while the model atmospheres are physically realistic, using large scale factors can produce unphysical situations where the gas abundance exceeds 100%. If this occurs, an error message will be displayed. The atmosphere model (US_Standard, Tropical, etc.) determines the temperature, pressure and gas concentrations at each height in the atmosphere. To adjust a gas concentration, choose a scale factor other than 1 (from 0 to 1000). For example, to simulate a path with 20% more water vapor, use a scale factor of 1.2 for H2O. The Atmosphere Browser tool displays the temperature, pressure and gas mixing ratios for the model atmospheres..
A-Z a-z 0-9 _ - .